William Huskisson (March 11, 1770 - September 15, 1830) was an able financier and a Member of Parliament for several constituencies. He also held various positions in Government, that included: Under-Secretary at War, Secretary of the Treasury, First Commissioner of Woods and Forests, President of the Board of Trade, Treasurer of the Navy, Secretary of the Colonies. At Parkside Railway Station, while attending the opening of the Liverpool and Manchester Railway, William Huskisson fell on to the tracks in front of Stephenson's locomotive, Rocket. The locomotive crushed and mangled his leg, which resulted in George Stephenson himself driving Huskisson, in a locomotive, to a hospital in Eccles. Unfortunately, he died from his injuries a few hours later. 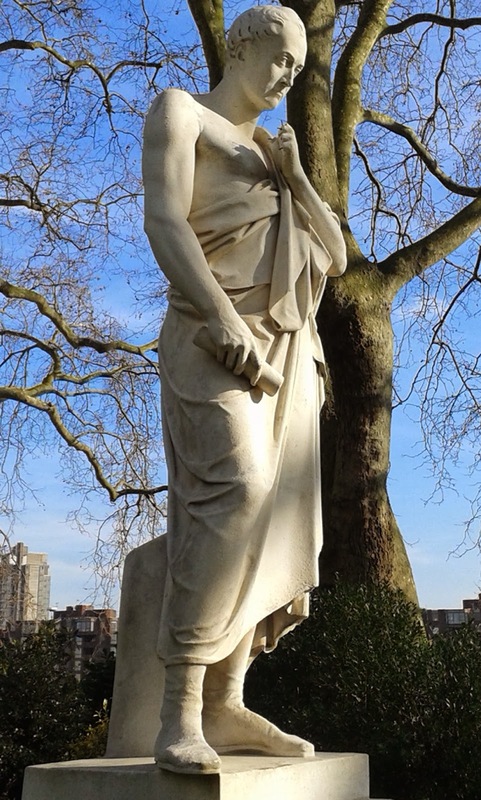 The statue was presented by his widow to Lloyd's (the insurers, not the bank), in 1847. They, in turn, presented it to London County Council, in 1915, who placed it in Pimlico Gardens.